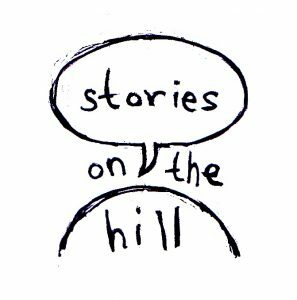 Hidden histories is the theme of this year’s Stories on the hill @nowa nowa hall. Mid-day 21st October to mid-day 22nd October, 2017. Histories stored in letters, diaries, oral histories or silently in hearts and memories. This is our third year creating a forum for writers and performers keen to both share their work and learn of its impact. 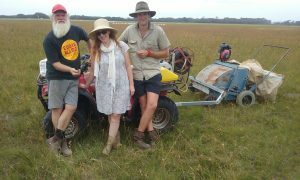 Wayne Thorpe, Bruce Pascoe and Jan Wositzky are returning to carry on conversations begun last year. You may have new questions, thoughts or want to contribute to change. You may simply enjoy the theatre of great storytellers. 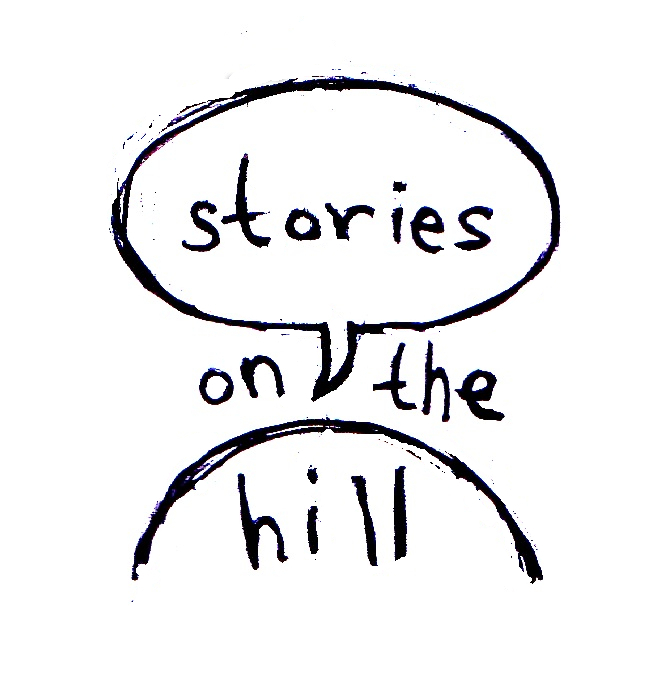 This year Stories on the hill links with FLOAT the Regional Arts Victoria Small Towns Transition project focusing on Lake Tyers (Bung Yarnda): its unique environment, its culture, the people past and present and of course the future. 1.00 p.m. Wayne Thorpe: Welcome to country is very much about this country and ways to care for it. Wayne has now published A story of Bung Yarnda (Lake Tyers) (2016) that invites us to look at Lake Tyers with greater awareness. Wayne makes the very potent point that the lake is a spiritual focal point for many people in this area, and while the indigenous feelings about the lake are one way of appreciating the lake, he acknowledges all walks of life can gain spiritual insight if they allow the lake time to go through the cycles at its own pace. Observation and patience are powerful personal attributes. Another thread running through the book is this lake is an example of many estuaries along the Australian coastline that in effect share the Bung Yarnda cycle and deserve the same respect. Bung Yarnda is locally often referred to as the Lake Tyers Aboriginal Trust, where as Wayne make the very strong proposal we should see the whole catchment as the ‘Bung Yarnda’ system, including the fish and plants on the other side of the bar in the ocean. This book contains a simple, but powerful environmental and cultural message for all of us around the world. 3.00 p.m. Dr. Auntie Eileen Harrison and Carolyn Landon: co-authors of Black Swan: a Koorie woman’s life (2011). Life has changed for Eileen personally and publicly since Black Swan was published. She is now Dr. Auntie Eileen Harrison a recognition of this journey through art and writing that shares old knowledge in new ways. A frank and powerful memoir of the life of an Aboriginal woman, from her early years on the Lake Tyers mission to discovery of her talent as a painter. ‘It’s bad luck to catch a black swan.’ As a child, Eileen set free a black swan caught in a hessian bag. Now the story of the magical black swan from her childhood provides an uncanny map for her life as she struggles to find her path. After many years she discovers her talent as a painter and builds a new life for herself. Eileen Harrison grew up at the Lake Tyers Aboriginal Mission Station in the 1950s as one of eleven children in a tight-knit and loving family. When the new assimilation policy comes in, they are wrenched from the Mission and sent off to Ararat in the hope that they will become part of that community. Unable to build a stable life in the face of isolation and discrimination, the family is torn apart. Eileen must become the protector and the peacemaker. A former secondary school teacher in Literature, English and Journalism it was while teaching at Warragul that she became aware that there was often more to seemingly simple stories she was asked to ‘help write’. An awareness that led to the publication of Jackson’s Track Memoir of a Dreamtime Place with Daryl Tonkin in (1999). Carolyn has continued to sit alongside people as they find the courage and words to share the highs and lows of their lives. Carolyn is now a recognised biographer/memoirist/historian and an Adjunct Research Associate at Monash University (School of Historical Studies). Carolyn has much to share from this journey of listening. observing, researching and crafting stories that give insight into lives lived in this landscape. Her most recent biography of the renowned botanical artist, Celia Rosser, Banksia Lady, Celia Rosser Botanical Artist was published in June 2015 by Monash University Publishing. Carolyn Landon has written several award winning memoir/biographies focusing on ordinary people whose lives define and are defined by the times in which they live, but this is the first time she has set her sights on a subject already known and admired for her extraordinary talents and artistic achievement. Landon is a newcomer to the world of Botanical Art, but has become a convert concerning all things botanical through her work with Ms Rosser. In order to fully understand who her subject is and what she has achieved, Landon has explored the history of art, history of Australia, history of botanical discovery, history of botany and the institutions that grew from discovery and science. Most importantly she has learned the place of artists in the midst of it all. 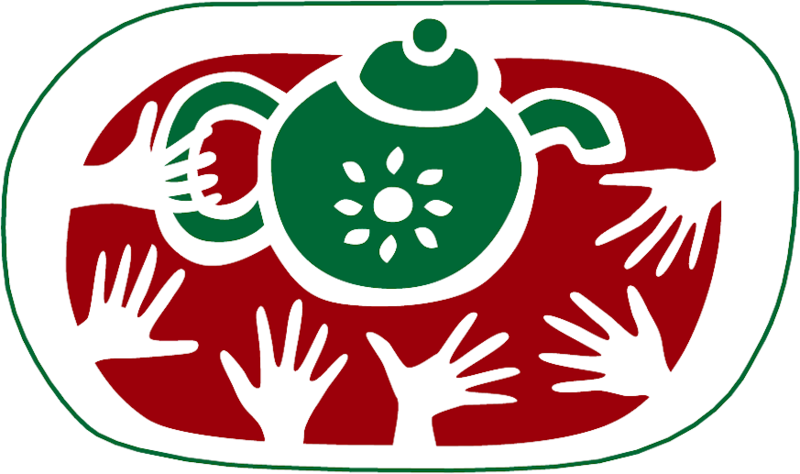 • Cups with No Handles, memoir of a grassroots activist (Hybrid 2008) a biography of Bette Boyanton, a founder of the Neighbourhood House Movement and social activist. 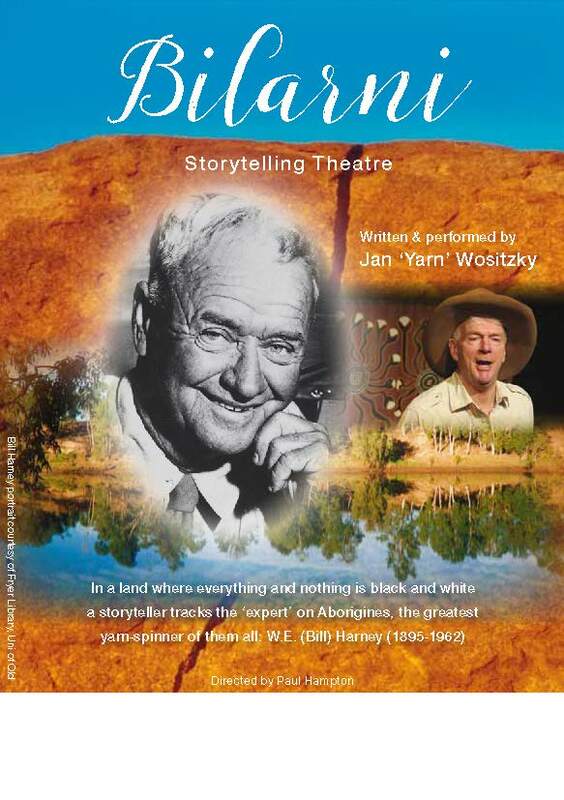 Bilarni – Storytelling theatre by Jan “Yarn” Wositzky Following last year’s impressive performance of William Murrungurk Buckley that gave insight into the settlement of Melbourne. Jan Wostizky is with us again this year performing Bilarni. This is great storytelling theatre that tracks the life of the greatest yarn-spinner of them all, the man who was known as the ‘expert’ on Aborigines – W.E. (Bill) Harney (1895-1962). A story that for Jan “Yarn” Wositzky began in the mid-1980’s when he heard the arresting voice of Bill Harney on the radio. It was a voice that set a new path in in Jan’s life, and took him ‘up north’ to many weird and wonderful adventures in a beautiful and brutal land, where everything and nothing is black and white. It does contain language that may offend – not suitable for under 12’s. Kicks off with Writers in the making. Megan Hand (a more personal story of recovery from abuse). Helen Sheil (Insights into how Helene Brophy’s changed our world). 11.00 a.m. Bruce Pascoe is an Australian Indigenous writer, from the Bunurong clan, of the Kulin nation. He has worked as a teacher, farmer, a fisherman and an Aboriginal language researcher. He is Director of Commonwealth Australian Studies project. He is working on preserving the Wathaurong language. His books include Fog a Dox, a book for young adults that won the Prime Minister’s Literary Awards in 2013, Convincing Ground about the Convincing Ground massacre, and Dark Emu, a book that challenges the claim that pre-colonial Australian Aboriginal peoples were hunter-gatherers. His research of early settler accounts found accounts of grain cultivation, flour, wells, and dams. 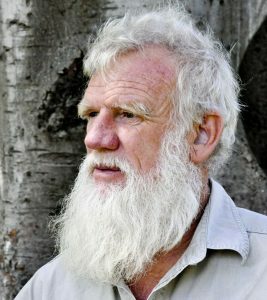 He edited Australian Short Stories, from 1982 to 1998. This story begins with bird calls, weaving the values of life, women and their place in the life men inhabit. It is an invitation to be aware of and ways to work towards a peaceful, gentle life that existed for generations.